Now that I have the ribbing completed and I’ve converted the Tilt Cardigan over to being knit in-the-round, I’m going to have to work on pocket design and soon thereafter, I’ll need to start deciding when and how to do sleeve hole shaping. 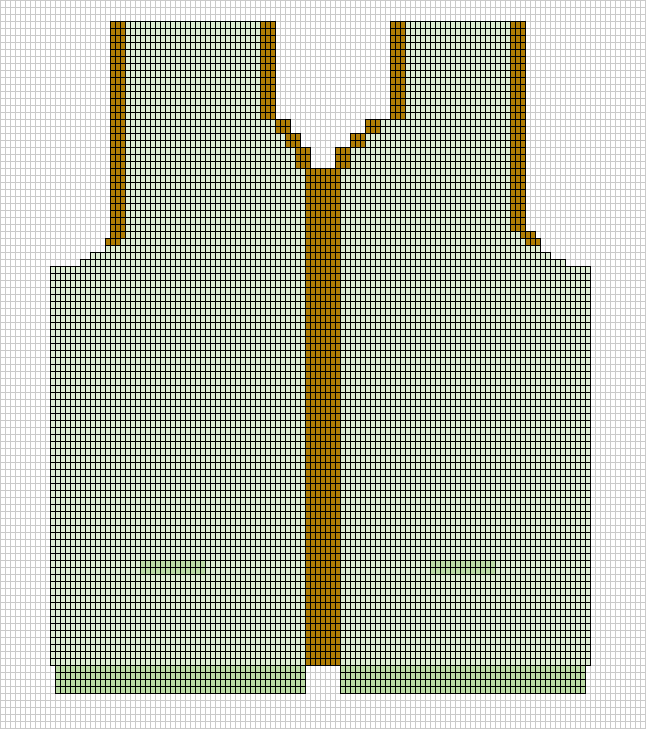 First of all, I needed a full profile graphic of the cardigan so I could foresee any issues I might have with shaping. The Excel diagram above is my starting point. It’s not completely true to the shape and ratio of the cardigan, but it will work fine for my purposes. 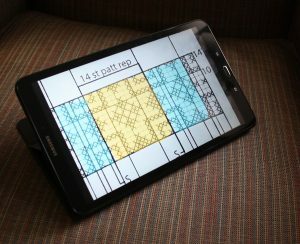 The delivered graph for the stranded color patterning for this design comes with graphs for multiple sizes of the sweate. It shows different starting and ending points and the same stitch repeat in the middle of the graph. So, I’ve done two things to help out my aging eyes and brain. First, I took a photo on my tablet of the graphic and converted it to PDF. I used the PDF highlighter feature to highlight the start and end points in blue and the main repeat in yellow. Then I printed off just this graphic. Now I have a readable version both electronically and hard-copy to take with me. The three main changes I’ve made to the original start of this cardigan have made a WORLD of difference in my knitting experience. Changing the color slightly was subtle, but allows me to much more easily follow the pattern and see it emerging even early on in the knitting. Switching from those horrendous needles to the Lykke interchangeables has made it a joy to knit. Converting to knitting in the round has sped up my progress. I think I may have already knit as much of the this garment as I had on the needles before in a fraction of the time! You may not be able to see any difference. In fact, it may even look LESS discernible in the first photo. But, the new darker main color yarn is showing the patterning a LOT better. I’ve completed over a full 14 row repeat. The section above the notched rib shows the part that will be steeked for the button band. The next photo of this beauty will definitely show you how easy the color patterning will be to see…just you wait and see! I learn so much from you, Joe. I have been knitting since I was about 10 years old (I am now 71) and I must have a pattern. 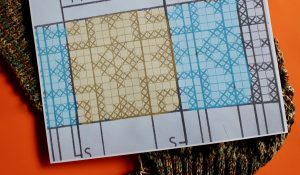 I have never had the ability or the confidence or the what-the-hell attitude to just forge ahead with something like the Pattern Redesign you are doing. Think I learned to knit at the wrong time! 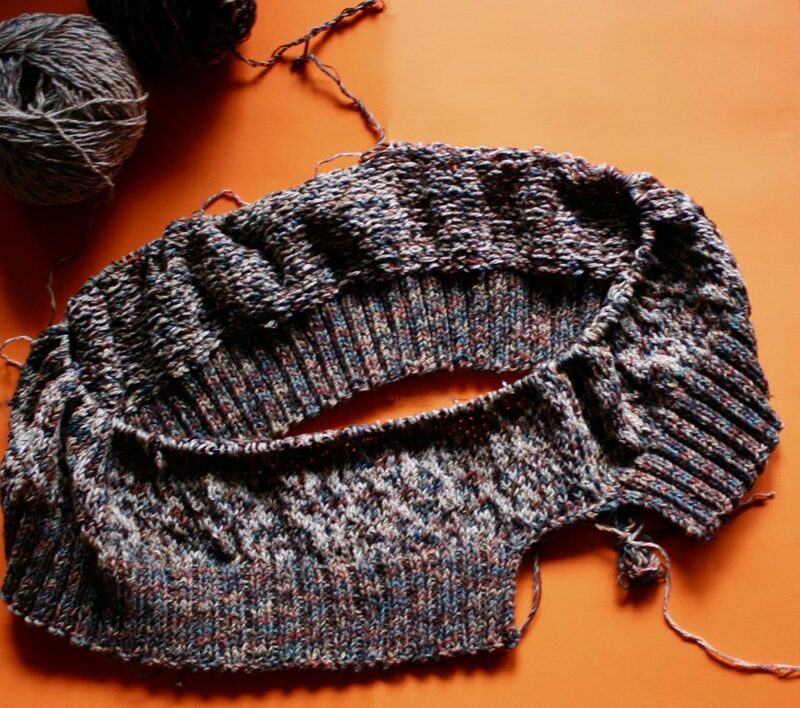 That is one of the things I love about knitters…some of us prefer patterns and some of us are on the opposite side of the spectrum and wouldn’t ever use a pattern. I’m in the middle…I like using patterns for shaping and sizing, but I feel free to modify things that make it more enjoyable or to make it fit me or Thaddeus better. You learned to knit at EXACTLY the right time for you!